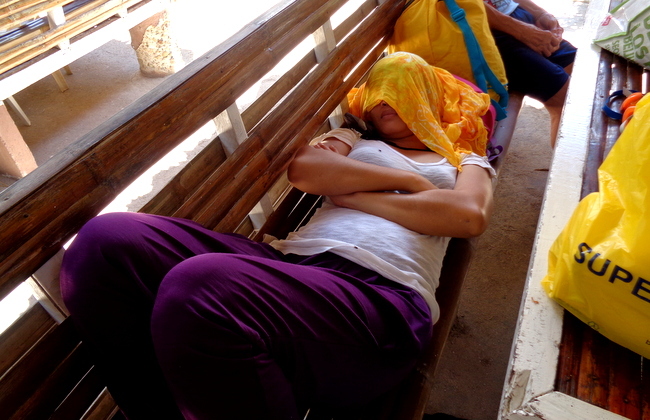 Taking naps in the Philippines is a common occurrence. Is it part of the Spanish siesta heritage or simply a nod to hardworking people that need a snooze wherever they might be? 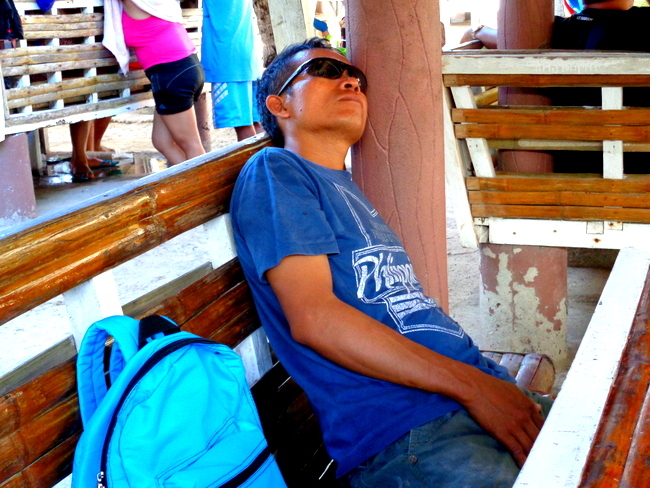 A restful day at Raymen Beach Resort in Guimaras, our island province home, provided the opportunity for some of our relatives to pay a visit to The Sandman. First up is our niece Michelle. She is listening to music as she drifts off to slumber land. Michelle’s hairy legs are somewhat concealed in this shot but check out this previous post to discover why our niece’s legs are so hairy. 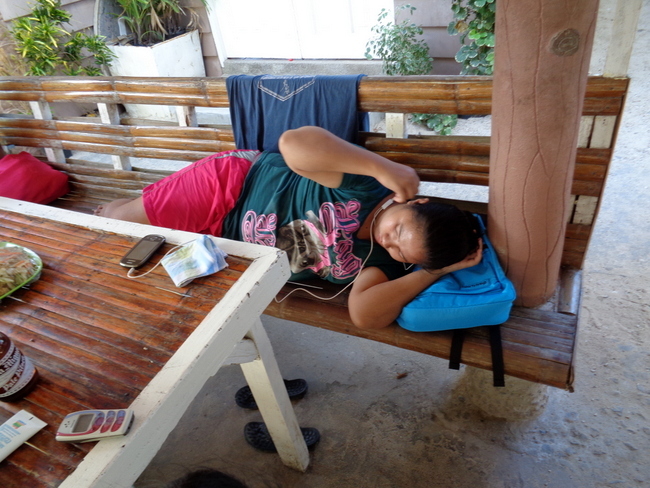 Here’s my sister-in-law Alida taking a nap. If anyone deserves some rest, Alida surely does. She has finished a summer school session for her pre-school and is now taking enrollments for new students for the next school year. Like her sister, my asawa, she always keeps busy. Next up is my brother-in-law Joery, Alida’s husband. Joery is the lead man on a crew working on our new property site in the Philippines and also has a salted egg and sari sari store business. In addition to those duties he cooks meals for his household which includes our two nieces and nephew that live on the island. That’s our nephew Sherwin sitting next to Tito (Uncle) Joery, who has finally succumbed to sleepy land and dozes off. I missed taking a picture of Lolo, my father-in-law, as he briefly napped and wisely did not take a photo of my asawa as she dozed off. She rarely checks out this site but I decided it would be smarter to leave her out of this post. I tried to sleep but it was way too hot for me. I got a sunburn walking around taking pictures which I will feature in future posts. A restful day at Raymen Beach Resort is hard to beat. 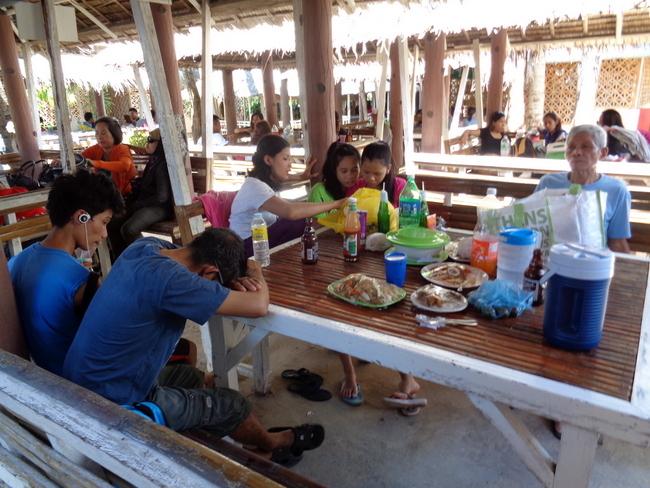 And a great time for my relatives to catch up on some much-needed rest. Glad to see everyone enjoyed a day at the beach. packing up the cooler and cooking more food then we all could ever eat while spending a family day at the beach is always a fun day. my nieces always pack all the beach gear frisbee, football. water guns, body board ,and snorkel gear. and shortly after arriving at the beach they are the hit of the beach with all the other kids which makes for some fun times and new friends. Can’t beat a day at the beach, especially with the hot summer we’ve been having, Roger. We do have goggles for the kids to wear but none of the extras that your crew brings along. I imagine that your nieces are very popular at the beach with all that gear. We used to pack a lunch but Raymen starting charging a “corkage fee” a few years ago and since the food at their canteen is very reasonably priced and is tasty (but pass on the native chicken) it saves my asawa a lot of work cooking everything.